I guess I can see why Vanessa gave away the gun but I don't agree with the decision. If Fisk trusts her enough to date her then why can't she keep it? The moment where it plays like Fisk is going to shoot the maître d' with her gun is pretty good though. The lack of Rosario Dawson makes me sad. For that matter, how does she know enough to bring the gun? I thought Fisk's dealings were super hush-hush, but Vanessa's all "I am the perfect amoral woman for you, of course I know what's up." The veil of secrecy that surrounds Wilson Fisk is clearly not all it is cracked up to be. Everybody knows his name. Sure, to the public at large, Fisk is an unknown quantity. But Vanessa's already gone on one date with the guy (which was interrupted by an obvious Russian mafioso) as well as interacting with him on prior occasions at the gallery, and no doubt had sized him up during those times. She could tell that he was a dangerous man; maybe not to her specifically, but dangerous all the same. Being a woman of intelligence and sophistication, she calculated her risk and went with the option of going on date #2, but this time with some added protection. I think the gun might also have been her way of opening Fisk up, by signaling to him that she had intuited his true nature and he and didn't have to pretend with her. Instead of making awkward small talk about which wine his assistant had picked out, they could instead focus on what Fisk was actually about. I guess I can see why Vanessa gave away the gun but I don't agree with the decision. If Fisk trusts her enough to date her then why can't she keep it? Because she doesn't want to. She wants Wislon to know that she realizes who he is and that she's ok with that and will trust him. It's like any dating situation, eventually you have to let down your defenses. But this time the stakes are higher. I've noticed that this series does an outstanding job of recycling/re-imagining really cool bits of business from other movies. The scene where Claire re-inflates Matt's lung with a needle made me think of the same thing happening in Three Kings; the gun in the purse had some of the flavor of the scene in The American, though with a different reaction on the parts of the characters. Interesting that both those movies had George Clooney? Also, that fantastic corridor fight sequence was shades of the hammer scene (which I think someone pointed out in an earlier thread) in Oldboy. I'm not saying they're outright ripping off stuff, I just think someone in the writing room has a list of really cool detail stuff from other properties that they work into the storylines in a really effective way. Which I guess is arguably just good writing. I mean they're tropes, right? But still, they're very distinctive tropes. Probably the only reason I recognized that phrase is because Wai Ching Ho is a native Cantonese speaker and has an accent. Question: Kingpin is supposed to be all muscle, right? Do we ever get an explanation of whether he's a mutant or if he works out really hard to get that big? I really appreciated that they showed Daredevil training at the end of the first ep, which ... seems rare. It kinda bugs me that all these super heroes and secret agents in TV and movies seem to just magically be huge and cut. A notable exception was Burn Notice where we see Westen training hard, and Westen routinely running and eating yoghurt and him exercising is routinely a part of the plot. I guess the second Bourne movie had a scene of him getting back into shape, too. Or Will Smith in I am Legend. Getting as fit as modern actors is hard work, and takes a lot of it. A little bit surprised that Charlie Cox had the genetics to do so. Question: Kingpin is supposed to be all muscle, right? Do we ever get an explanation of whether he's a mutant or if he works out really hard to get that big? He's never been a mutant or otherwise superpowered in the comics -- just a big guy who yes, works out a lot and is good at unarmed combat. 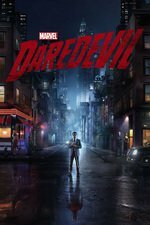 Netflix Already Renewed Marvel’s Daredevil for a Second Season. That is fantastic! Madam Gao might be my favorite character now. In the comics, he's just big from working out. On this series, it felt less like D'Onofrio was muscular and more like he was just a big guy with a willingness to be unflinchingly brutal, like his only super power is being ruthless. The show sells it, though, which is great. As far as superheroes training goes, I've probably just watched too much Arrow because I feel like I see superhero training montages in my sleep, these days. Also Madam Gao! She's the best. We need to get through these so we can talk more about late series Madam Gao. I really loved that scene with the camera in the cab with one of Madame Gao's blind drugrunners. Just a gorgeous and clever bit of cinematography, and the kind of thing that really makes this show stand out from the rest of the MCU and other TV shows. The way the camera slowly establishes an almost 360 degree view of the alley from the back seat of the cab to show where the Russians go, then slowly swings around to show Matt looking ominous and dangerous in black, before swinging slowly back around again to show that Matt has disappeared and shooting the ensuing fight from the vantage in the back of the cab...it built tension beautifully and just made the fight so much more interesting to watch. Also, a nice bit of sound design: after the blind drugrunner is shot and the Russians are trying to figure out where Matt has gone, you can hear a heartbeat-like sound that varies in volume as the Russians move around the cab. A nicely subtle way to bring Matt's POV into the scene; he's judging the Russians' location based on their heartbeats. We need to get through these so we can talk more about late series Madam Gao. I'm actually only on Ep. 6 myself, but I don't mind if someone else starts posting the rest of the series more rapidly. For various reasons, I don't think I'm going to be catching up very quickly. In the comics, he's just big from working out. On this series, it felt less like D'Onofrio was muscular and more like he was just a big guy with a willingness to be unflinchingly brutal, like his only super power is being ruthless. Yeah, here's very much The Will Made Flesh and even his meatsuit can barely contain him. D'Onofrio does a great job bringing that across, but then again, he has experience playing a malign force pretending to be human. I think the great thing that D'Onofrio does is communicate that Fisk is not really in control of himself; that underneath his facade of control is this endless terrified rage. It makes the character really genuinely scary and is informed by what we learn about him over the course of the season (being vague since I can't remember which episode that is and I've finished the series). Also being vague here but I ended up concluding that the character is a set up for the Iron Fist series they are going to do. I guess we'll see if that's right. Pretty sure she said "lao pengyou," (老朋友) which is "old friend" in Mandarin, and quite respectful. And makes a lot more contextual sense than anything sassy. Oh, I heard it as 男 (male; "lum") pengyou, which in Cantonese ends up modifying that phrase to boyfriend. Also, her tone was pretty peppy and Wesley, who presumably speaks Mandarin, translated the entire conversation as "She's happy to see you." But on listening again, you're probably right. Shucks. then again, he has experience playing a malign force pretending to be human. Hey, that's no way to talk about Orson Welles. The moment where it plays like Fisk is going to shoot the maître d' with her gun is pretty good though. I felt like they had Fisk put the gun in his pocket largely in service of that, and I forgave them it not making great sense for him to have taken it because that was so interesting. But I think if it was supposed to communicate Vanessa making a decision about trust they should have communicated it better. Gao being teasing would actually make good sense for something upcoming, though it wouldn't predict or change anything. 男 in Mandarin is "nán," no luh sound at all. She would have to have switched to Cantonese just for the greeting. Not that it wouldn't have been awesome, if that had been what she said. Nothing about the meta-comment on Wilson Fisk the comic character? Fisk and Vanessa are discussing a previous paramour, and she describes his sartorial tastes as tending towards white suits and, get this, an ascot. D'Onofrio pronounces that to be "a bit much". This is, in fact, a fairly accurate (if vague) description of the Kingpin in comics. I love this. And also "Senor Foggy." I would love to see a bar named Senior Foggy's. Where does the nickname come from, anyway? 1) Josie's Bar - Though I always envisioned it to be more popular but with a darker and seedier crowd, the sleepy, three-quarters empty locals bar with it's collection of barflies is a good look, too. 2) Turk Barrett - I like the way the guy is playing him, which is to say, smarmy. I keep looking out for anything that might be interpreted has his friend Grotto. If they put him in a Mauler suit, I will squeal with glee. I love Josie. I want a Josie miniseries. Where does the nickname come from, anyway? I don't think the nickname has ever been explained in the Marvel universe, but he comes from a family with awesome nicknames. His mother's nickname was "Razor." A Damage Control series would go over well, done as a dramedy. And since they've introduced Mockingbird in Shield, there's a slim chance that I might get to see Hawkeye and Mockingbird together, or, since Hawkeye and Black Widow have had a 'history' of sorts in the MCU, perhaps they're setting up a Mockingbird and DD thing. Probably not. Either way, this is several Negative Zone's worth of fun to contemplate. I'm late to the party, but I'm glad I finally started watching because I'm really enjoying it. The only thing that isn't working for me is Matt and Claire: she's been through hell because of this guy who she doesn't even know, and now she has to hide out at his place, so when he moved in for the kiss I thought it was pretty damn creepy. But hey, it's okay because she's already falling in love with him. Really? That's kind of lame. Speaking of SHIELD and slim chances, I hope Matt gets to meet Carl Creel in the flesh/stone/whatever in a future season.